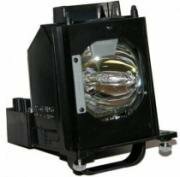 This OEM replacement TV lamp from eReplacements is 100% compatible with your Mitsubishi TV and replaces Panasonic part number misogi. This lamp is manufactured for long lasting performance in ISO 9000 factories using an Orem/Sylvania branded bulb with less than 1% overall defect rates. Our Orem bulbs are the same bulbs used in your original Mitsubishi TV lamp so you can be confident you are getting the highest quality lamp. The lamp comes complete with a brand new bulb and plastic lamp housing, is easy to self install and requires no rewiring. Refer to your TV manual for specific replacement instructions for this part. eReplacements TV lamps all come with a 180 day warranty while most competitors offer only 90 days. Why pay more for an expensive OEM replacement lamp? hundreds of thousands of customers over the past decade have trusted eReplacements to provide them with quality replacement TV lamps for less. Order your OEM replacement Mitsubishi TV lamp today backed by our 30 day money back guarantee, 180 day warranty and no-risk secure online ordering.